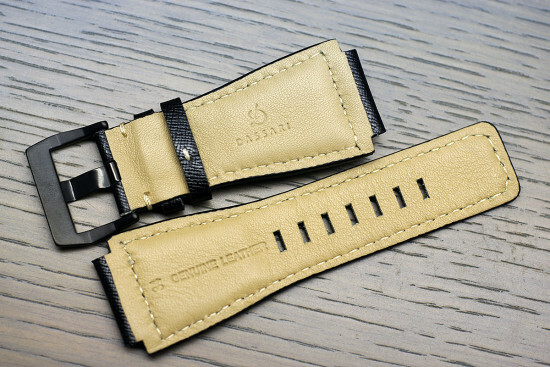 Dassari has been making mid-priced straps for some time, and is quite known among watch buyers. Information on their site is sufficiently vague as to their country of origin (or countries), which means they are likely made in China or somewhere in Asia. At any rate, that doesn’t really mean much as there are plenty of fantastic straps coming out of Asia these days. I see a lot of them on eBay, but this sample was procured from Strapsco. 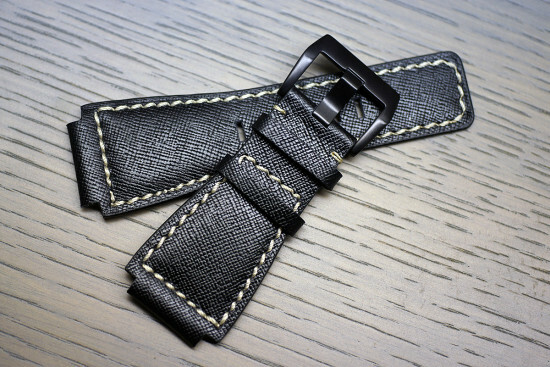 I picked up this strap for my Bell & Ross BR03-92, since I wanted a black leather strap for it but wasn’t sure if I wanted to fork out the cash for something custom made yet. I already have several straps for it, but nothing that is black and leather surprisingly. You can see the Saffiano texturing on it, reminds me of Prada’s Saffiano leather, though not quite as nice. 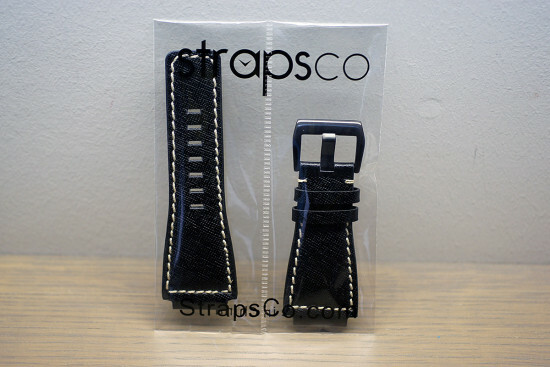 I’d like to make one observation on the strap, and its a small complaint regarding the quality control. 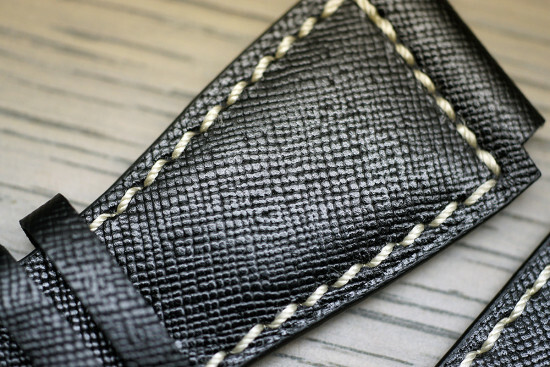 There is a funny stitch close to the lug end of the long tail of the strap, where it looks like three short stitches instead of two regular ones making the stitching look uneven. It doesn’t drive me crazy, but I can see it bothering many people. It comes in a quaint little double cello bag that works well, courtesy of StrapsCo. No frills, but it does the job and doesn’t look cheap. I also like it better than those hard plastic snap cases that Hadley Roma and some other companies use that look so dated. They remind me of buying straps at the department store “watch repair” shop. The places that really only know how to change your batteries. I’m not sure what kind of packaging another online retailer would use, however. The back of the strap features nice soft tan leather lining, which is very comfortable against the wrist. I wore this strap quite a few times and it is quite soft and pliable. It does have some rigid padding at the wider part of the strap so it conforms to your wrist after a couple times of wearing it. Its marked with the Dassari logo, and the lug width. Here’s a close up of the Saffiano leather, and as you can see, not quite Prada quality close-up but it does have a nice look to it. Its got a slight sheen to it, but not overly shiny and goes well with the Bell & Ross. 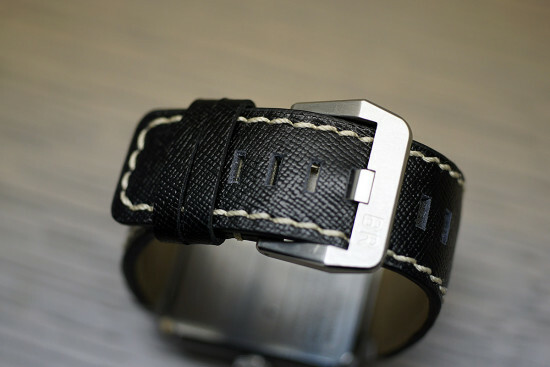 My wrist is 6.75″, and the strap wears on the middle hole, with roughly an inch to spare in size both larger and smaller. Finally here’s a shot of it mounted on my Bell & Ross BR03-92, unfortunately to get the best shot I had to show it from the back! But I also wanted to show it mounted with the original B&R buckle. As you can see it fits perfectly, with the wide tang perfectly fitting the holes. 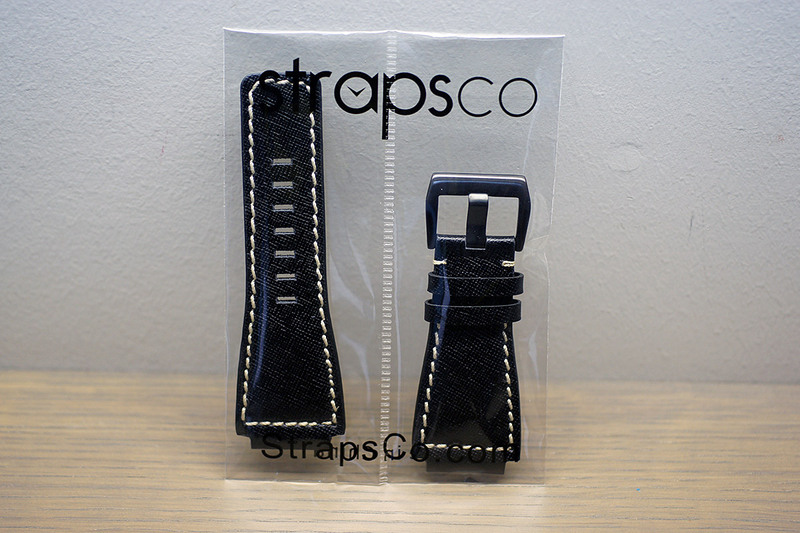 Overall very happy with the strap, especially given the modest cost and great service from StrapsCo.